BANGI, 12 August 2014 – The role of the emerging economies are becoming more important as an indicator for the global economy. 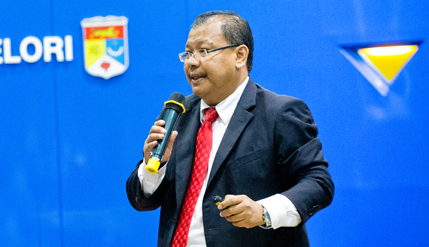 Vice-Chancellor of the National University of Malaysia (UKM) Professor Dato’ Dr Noor Azlan Ghazali said there is now a trend that even when economies of the Group Of Seven nations start to falter or stagnate, the performance of the middle-income nations like Malaysia continue to grow. Giving a talk on Transforming The Nation – The Malaysian Experience at the Emerging Markets Business Conference here today, he said Malaysia realised it should not only depend on the West for trade. He said Malaysia and Latin American countries like Mexico and Venezuela strengthened trade ties between them without having to go through the West. They understood that they could prosper by diversifying their sources of trade. Among those present at the conference were exchange students from Poland, Mexico and ASEAN universities students taking part in a youth volunteer programme at UKM. He said the fourth Prime Minister Tun Dr Mahathir Mohamad envisioned that Malaysia could become a developed economy by the year 2020 and thus even with the Asian Financial Crisis in 1997, Malaysia managed to pull through and thrive again, although the means might be unorthodox such as currency controls. In the early nineteen seventies the world’s economy was determined by the rich industrialised West; America, France, Germany, Switzerland and others. However going into the new millennium, the economies of East Asia began to show clear growth while America and the European Union slowed down. Right now Western Europe and the United States can barely register any growth at all, but it is not unusual for South-East Asian countries to record at least 4% growth or higher. Prof Noor Azlan said one of the reasons for their success was diversifying their trading partners though they are still too dependent on the developed nations for trade. “Our economy is very vulnerable. We don’t know what will happen next,” alluding to the global economy which was facing an uncertain future. Realising the condition, ASEAN nations have agreed that by 2015 they would form the ASEAN Economic Community as the first step towards economic integration. Answering questions, Prof Noor Azlan said ASEAN aims to eventually have standardised and common regulations on a wide array of sectors, including education and finance. A Filipino student had asked whether students from an ASEAN country would be able to transfer credit hours of their courses to a university in another ASEAN nation. Tun Dr Mahathir earlier gave his keynote address at the conference. Other participants were Chief Executive Officer of the Small and Medium Enterprises (SME) Corporation Malaysia Dato’ Hafsah Hashim and Emkay Group founder and advisor Tan Sri Mustapha Kamal Abu Bakar.